Horgan said Trudeau made no threats during the meeting. Prime Minister Justin Trudeau speaks before a meeting on the deadlock over Kinder Morgan's Trans Mountain pipeline expansion with B.C. Premier John Horgan, left, and Alberta Premier Rachel Notley, in his office on Parliament Hill in Ottawa on Sunday. OTTAWA — Prime Minister Justin Trudeau is putting taxpayer money where his government's mouth is, promising to deploy both financial and legislative tools to ensure the disputed Trans Mountain pipeline expansion between Alberta and British Columbia is able to proceed. 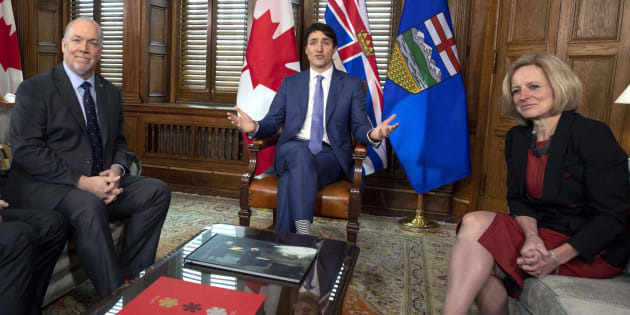 At the same time, however, Trudeau — speaking after a rare Sunday meeting with the warring premiers from both provinces — concedes there is more his Liberal government is willing to do to protect the B.C. coastline from a possible oil spill. Trudeau spoke at the end of a remarkable eight-hour stopover in the national capital, an unscheduled break from his overseas trip to accommodate the last-minute summit with B.C. 's John Horgan, who has staked his government's survival on opposing the pipeline, and Alberta Premier Rachel Notley, whose province's economic health depends on it. It has been a week since Kinder Morgan announced it was halting all non-essential spending on the plan to build a second, bigger pipeline parallel to the existing one between Edmonton and Burnaby, B.C. The company gave the Trudeau government until the end of May to reassure its investors the pipeline would be built, despite mounting opposition. After the meeting, Notley and Trudeau exuded confidence the deadline would be met and the pipeline would proceed. Horgan, however, betrayed no evidence that their confidence had anything to do with him. If anything, the positions of the two NDP premiers appeared all the more entrenched when the meeting was over. Notley said legislation to allow Alberta to cut oil supplies to B.C., sure to send gas prices there soaring, would be introduced in the legislature this week. Horgan said a court challenge testing whether B.C. has the jurisdiction to regulate what can and can't flow through the expansion will proceed before the end of the month. The chasm between them did not go unacknowledged by the prime minister. Prime Minister Justin Trudeau speaks during a press conference to discuss his meeting with Alberta Premier Rachel Notley and B.C. Premier John Horgan on the deadlock over Kinder Morgan's Trans Mountain pipeline expansion, in Ottawa on April 15, 2018. "We must recognize that they remain at an impasse, which only the government of Canada has the capacity and the authority to resolve,'' he said. As such, Trudeau said he has instructed Finance Minister Bill Morneau to sit down with Kinder Morgan to find a financial solution that will soothe their investors. He also promised legislation that would reaffirm Ottawa's authority to press ahead with a development deemed to be in Canada's national interest. He said the negotiations with Kinder Morgan wouldn't play out in public, and he would not elaborate on exactly what the legislation will say. Kinder Morgan, for its part, would not say Sunday whether it felt mollified by the day's events. "Our objectives are to obtain certainty with respect to the ability to construct through B.C. and for the protection of our shareholders in order to build the Trans Mountain Expansion Project,'' the company said in a statement. Trudeau said the pipeline was approved by his government in 2016 after a rejigged environmental assessment and Indigenous consultation process, and only in concert with the Liberals' climate change and oceans protection plan. Approval came in consultation with the previous B.C. Liberal government, which gave its consent to the project after its own conditions were met. Horgan's election last year changed that. His minority government exists at the pleasure of the Green party, and on condition of his continued opposition to the project. Trudeau made it clear Sunday that Horgan and his government are the ones wholly responsible for the impasse. B.C. Premier John Horgan leaves after a meeting with Prime Minister Justin Trudeau and Alberta Premier Rachel Notley on the deadlock over Kinder Morgan's Trans Mountain pipeline expansion, on Parliament Hill in Ottawa on April 15, 2018. The federal government can and will do more on the pipeline's potential environmental impact, he added. But he also accused Horgan of ramping up his rhetoric about environmental uncertainty and gaps in the federal oceans protection plan, without providing details. Horgan blamed the lack of specifics on the dispute itself. "We have been working at the official level for some time laying out concerns, and I was encouraged that today's meeting will allow us to get back on track in that respect,'' he said. A lack of scientific clarity on how diluted bitumen behaves in water, and a lack of political clarity over who is responsible to pay in the event of such a spill, are two of his chief concerns, Horgan added. Indeed, knowledge is limited when it comes to how diluted bitumen — known colloquially as dilbit — interacts with water, and how best to contain and clean it up. Dilbit spilled into Michigan's Kalamazoo River from an Enbridge pipeline in 2010 cost billions to clean up, with parts of the river closed for years afterwards. Notley, meanwhile, said she felt "a lot better'' following the meeting — and that once Morneau's talks with Kinder Morgan were complete, the project would proceed. "I'm quite confident that should these discussions end successfully, that the pipeline will be built — and that is good, because the pipeline is in the national interest,'' she said. Alberta Premier Rachel Notley speaks speaks during a press conference to discuss her meeting with Prime Minister Justin Trudeau and B.C. Premier John Horgan on the deadlock over Kinder Morgan's Trans Mountain pipeline expansion, on Parliament Hill in Ottawa on April 15, 2018. Before Sunday's duelling news conferences were even complete, Conservative Leader Andrew Scheer was front and centre, accusing Trudeau of sitting on his hands for too long and frittering away investor confidence in Canada as a whole. Alberta's Opposition leader, Jason Kenney, also said Sunday's meeting didn't bring the pipeline any closer to construction. He said government investment in the project would do nothing to solve B.C. 's continuing opposition. Kenney repeated his calls for the prime minister to penalize B.C. by withholding federal dollars for infrastructure and jobs training. He noted Trudeau's father would not have stood for what the Horgan government is doing — despite his reputation as an oilsands opponent. "I believe that (former) prime minister Pierre Trudeau — who was no great friend of Alberta's energy industry — would not have tolerated the ... lawlessness and violation of the Constitution that we are seeing right now,'' the United Conservative Party leader told reporters Sunday.